This is a fantastic route that showcases the best of the escarpment rides, the great sweeping descent and single track to the two rivers (hence Dos Rios) and the gradual and very manageable re-ascent to the Pump with plenty of great track and views in between. It is not a hard ride, about 3 hours of pedal time, and plenty of options to reduce or extend as you go, this one started from a private house but anywhere along the Chifwema Road would be fine. This is a great and not too difficult loop of the escarpment terrain. Thje descent is via the fun filled Pump Down route, cross country to the Pitcher’s Mound and then regaining the height via the steady and rewarding single track of the Creeper. A fast, flat stage along the middle plateau follows then a final push back on the Escarpment Path and home to the PX. Nothing too technical but start early and take adequate water! So called because of the steady, gradual climb that creeps up the escarpment in contrast to the short, sharp pull of Profanity Hill, this route is a taxing and longer loop of the valley floor below the escarpment off the Chifwema Road. The start and middle sections are nice and easy, flat or downhill with the odd river crossing or two. Once at the Pitchers Mound, turn right and head away from Profanity Hill following some awesome single track back up the escarpment. The final pull up to the height of the start takes in the brutal Hamburger Hill, so called because completing it justifies mass hamburger consumption before long and rolling ridge ride drops you back onto the Chifwema Road. 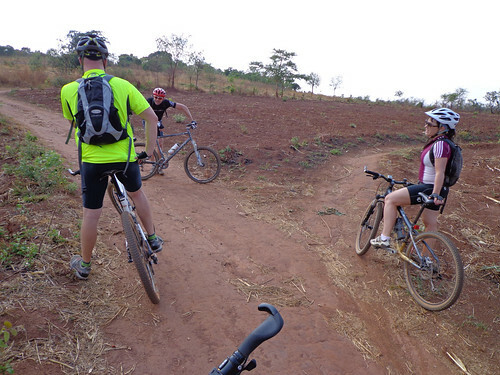 HH is a tough bike hike, not for the faint of heart or limb. This route has been cleaned up a bit and comes in at 57km. Take plenty of food and water. Incidentally, if you do run out of water in this area, pumps can be found at 99% of the schools, often found on one of the more substantial paths. This is a mixed terrain trail about 60/40 jeep track to wide footpath / single track. There are some great descents (with corresponding climbs) and some good views off the escarpment and down towards the Lower Zambezi. Technically there are a few tricky bits but generally nothing too severe, take plenty of water and some food to recharge for the climbs and allow 4 hours or so. This route actually was mapped from a start and finish in Kabulonga, (hence the longer distance) but could easily be started from either Oxygym or the Leopard’s Hill Polo X Club. 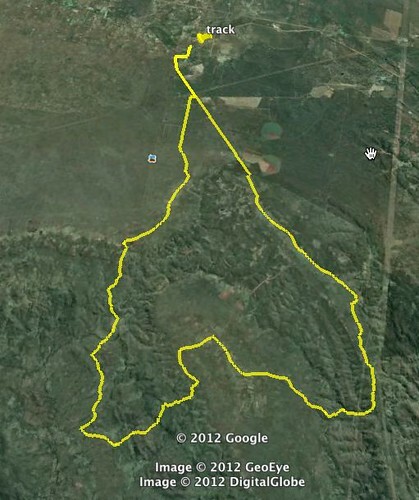 It starts along the line of the Chifwema Road which can be tedious when very dry but then diverts off into two loops, the smallest and furthest of which has some great trails before leading back to hardpacked village trails and a route back to the main Chifwema Road with plenty of option to vary en route. Take plenty of water and food.